View cart “Emanuele Barbella: Six Violin Sonatas” has been added to your cart. Irriverente is an Italian word that means Irriverent. It implies something deliberately out of a preconceived scheme, and that wants to provoke an exact reaction. This recording is not a compilation cd indeed. It is a sort of bridge between what is considered usually classical music and other genres like jazz, mainly, and folk music. The first piece by Leo Brouwer shows the spirit of this precisely, with his melancholy and contamination between styles. As the title itself states, “Soft Winds” is a slow and soft breeze that blows calmly on a hot day. The simple and very discreet theme is built on an equally simple harmonic structure, where similarly the solos lean. The compositions of Salvatore Salerno are in some ways melancholic too. There is always a reference to the native land, Sicily, so admirably described above all in the passages “Penombra” and “Trio Mediterraneo”. Klezmer music was played in the Jewish villages of Eastern Europe for parties, ceremonies, weddings to encourage people to dance by inviting them with popular motifs. These typical forms inspired to the composer Roberto Pansera his piece: the “sher”, the “doina”, and the “hora”. “Moonglow” is a famous song from the early years of the swing era. Later forgotten, it was re-evaluated in 1956 when it was included in the film “Picnic”. A very captivating and seductive theme that stands out even more at the end re-interpreted from the clarinet to the low octave after an improvisation developed in the acutest area of the piano. Dave Brubeck is a composer who has written lots of excellent music. His rhythmic exasperation and harmonic complexity are evident in many of his passages. Those proposed here are calm and very descriptive. “Do not be that way” is one of the numerous songs often performed by Benny Goodman, very pleasant to listen to. Even improvisation at the piano, simple in its lines, wants to keep the spirit of the piece. 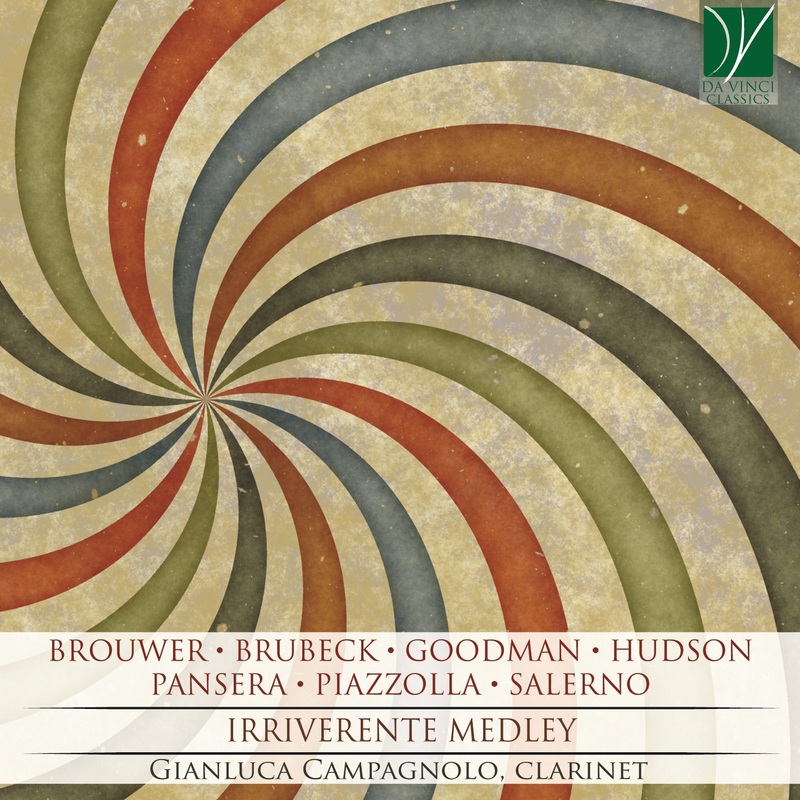 The last piece that gives even the name to this album is “Irreverent medley”: a mix of trendy pieces: “Frère Jacques [Brother John]”, the famous mazurka by Migliavacca and the Cumparsita. As bonus tracks, recorded in several sessions, three compositions by Piazzolla, part of the series of “Seasons” as a sort of program music. Sometimes melancholic, full of references from the master of the tango nuevo. They follow the path of a close and active relationship of the folk heritage of the tango with other musical universes, between classic and modern. Cancellieri, Francesco Scrofani (Pianist), Pianist, composer, music critic, teacher and lecturer, he performs concert activity as solo artist in chamber and jazz groups. He collaborates with internationally known musicians. He has made several recordings for Italian and foreign record companies. He wrote the volume “Musica Ridens, humorous expedients in 55 years of compositions” published in 2015 by Zecchini Editore srl. Campagnolo, Gianluca (Clarinettist), official artist of Buffet Crampon, Vandoren Reed, Lomax Classic Mouthpieces and the Backun Barrels, he has got a considerable artistic activity all over Sicily, in Italy and abroad. As a clarinettist, he has won many National Prizes and has attended various specialization courses. He has taken part in several programmes on private and public networks – as RAI – and in broadcast. He is a composer and a member of SIAE and has published numerous compositions, essays and articles; he has been a member of jury in various National and International Competitions. He has recorded for Centaur, Bongiovanni, Amadeus Arte, Eco, Taukay and published the Complete Method for Clarinet in ten volumes printed by By Bess and the New Complete Method for Clarinet, a publication completely dedicated to the clarinet divided into 12 volumes published by C.D.B. He has also published for Amadeus Arte, Eco, Armelin and Artemide. He has practiced with the Teatro Massimo Orchestra in Catania, the Youth Sicilian Symphonic Orchestra, the Iblea Symphonic Orchestra‘ and the Capita Selecta Hollandian Orchestra. He has taken a course of lectures on the Methodology of the expressive activities to Catania University and on Clarinet to Jakarta Pelita Harapan University and El Salvador University.